TOFU MOM . . . and gravy! : I Have Crazy Children. I do, I have crazy Sprout children. Of course I love them to death in spite (or because) of their craziness, but they keep me on my toes never knowing what to expect next. I present the following evidence. 1/2 cup cooked spaghetti or angel hair, chopped up - aprox 1 inch pcs. Mix pressed garlic with margarine. Spread thinly on bread. Mix sauce into spaghetti. Stir in olives. Crumble the cheese and mush it around into the spaghetti. Lay 1 slice bread on heated Panini Grill, buttered side down. Heap spaghetti mixture onto bread and spread evenly to edges. Lay remaining bread slice on top, buttered side up. Grill until sandwich is toasty and cheese is melty. I thought I was the only one that ate spaghetti sandwiches =). It's good with lots of sauce and vegenaise. It actually looks good with the grill marks. My family would love this. 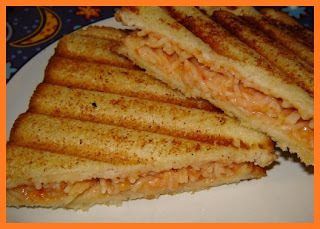 My husband and son already eat spaghetti sandwiches anyway, but to add cheese and grill it would just take it to a whole new level. I don't really like spaghetti, but I've never met a grilled/fried sandwich that I could resist. I might just have to give this a try! that looks like something I would have eaten when i was your Sprouts ages. That's a great idea! It's like eating spaghetti with garlic bread but all in one cute package. i'm so happy to know that there are other spaghetti sammich eaters out there. your children are amazing. i can't wait to see what kind of sammie they make next. What a wonderful idea! What kind of panini maker do you have? I am looking to get one.